The voids made of bare concrete in the Jewish Museum Berlin stand in all drama for the attempt to extinguish the Jews in Europe and are reminiscent of the barbaric murder of Jews during the reign of the National Socialists. Mischa Kuball (* 1959, Düsseldorf/D) has designed an impressive light installation for these voids, 24-meter-high, empty shafts. 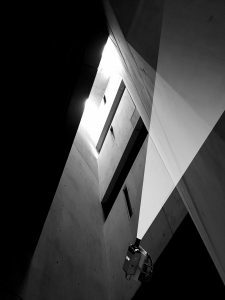 Circular and trapezoidal light fields run up and down the concrete walls via rotating projectors – an aggressive, delicate, high-pitched light. Rotating mirror elements and strobe flashes generate emotional high voltage in the otherwise dark shafts. Kuball’s installation “re.so.nant” expands the emptiness, cold, harshness and loneliness of the voids, which are of utmost symbolic importance to the museum. The exhibition is accompanied by 60-second sound clips composed by more than 20 musicians for the installation. 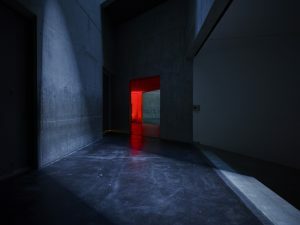 The adjacent installation dips the room in an intense red light and it flashes brightly from the corners, so that the silhouette of other visitors remains as an afterimage for a while on the retina. Kuball produced a strong impact, he explained: “I wanted a resonance between architecture and skin”.